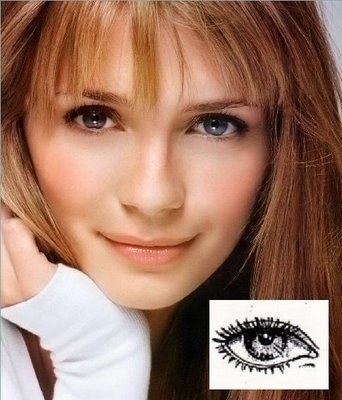 Are you one of those who has deep set eyes secretly think covering them is a tricky thing to achieve? Well, there could be a tiny bit of trouble with deep set eyes as they tend to really sit back into the socket protruding the brow bone forward, but when we are around there’s nothing to be afraid of. Yes, I understand there’s nothing much we can do to change your eyes, but can certainly make it look different with a little makeup! In that hope, today we will guide you through one of the most popular techniques to accentuate your deep set eyes with makeup. So read ahead to get your peepers all covered up, all nice and easy. For the starters, we need to create the illusion of decreased creasing and bring the eyelid to the forefront. So in order to obtain that, get your hands on a yellow concealer. Yellow color correcting concealers are a great way to brighten up the complexion as it evens your skin tone overall hence, they are a great choice to decrease the crease by lighting the lid up. For your basic concealing, apply the yellow concealer – we usually use Maybelline Corrector Concealer – to the whole eyelid and also into the crease. Do not go up to the brow bone and blend it evenly. Now that your base is done, next comes the application of your eye shadow. But before that remember to prepare your eyes; we have added a small amount of Urban Decay Eyeshadow Primer Potion – Original on our entire lid right before applying our shadow. Now for deep set eyes, it’s often suggested not to use any dark color on your lids. Ladies, remember smokey eyes with those dark sultry shades are really not for you, but you can opt for light Smokey eyes. Take the lightest color of shadow that you are planning to use, say it’s a lilac or light pink or even silver and apply that on to the lid. Just the lid! We prefer Stila’s In The Light Eyeshadow Palette. We love its consistency which is smooth and silky; the eye shadow doesn’t leave creases after the application. Now comes our favourite part – blending. Just take the darker shade (recommend, Moonshadow Baked Palette – In the Dark) and apply on to the crease fading it as much as possible towards the brow bone, but not totally covering the brow bone. The more space you leave in the brow bone the more protruding the eyes will look. Cover at least 1/3 or a little more of the brow bones. Blend the colours properly to avoid any harsh lines. Sweep on a silver highlight on to the remaining part of the brow bone and blend it evenly. This will give hints of lighter and darker shades at the ends of your eye, creating a horizontal V-shape. Colors for liners like deep blue, electric blue, golden or bronze or even moss green and silver works best for protruding eyes, and if you want to go in for traditional black or brown then you can opt for that as well. Just ensure you do not neglect lining closer to your rim. And that’s it you’re done. This is among the best deep set Eye makeup styles ever! Hope you liked this post! Do give this makeup a try if you got the eyes of this kind and if you have any suggestions, please feel free to write to us by commenting below. We value your feedback.